The saying, "and now for something completely different!" almost fits here. Last week brought Part 5 of The Wonder Child. It was the conclusion of the version by J.G. Hornstein of Wilhelm Hauff's "Der Zwerg Nase." I frankly confess I prefer Hornstein's setting the story in old Bagdad. Somehow it brings the story to life for me just as the tale of "Caliph Stork" clearly needed that setting. Hauff used the frame of slaves telling the story to the Sheik of Alexandria, but this story must have been told by a German slave. 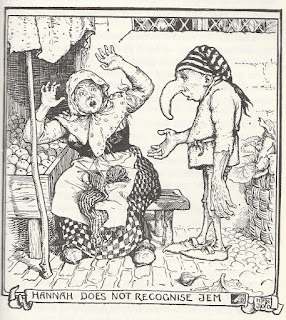 The story is from Hauff's Märchen-Almanach auf das Jahr 1827 (if you can read German and want the story straight from the Hauff's mouth.) Because Google Translate is the best I can manage in German, I put the title in and at first it came up as "The Zwergnase", but I could tell Nase = Nose, so I just entered Zwerg and it came up "Dwarf", then I added Nase a second time and the title became "Gnome Nose." That's fairly close to the version found in Andrew Lang's Violet Fairy Book for today's "closer to the original" story of "The History of Dwarf Long Nose." Lang, in his Preface, names his translator as a Miss Blackley and her version starts out fairly close to the original as best I can tell from Google Translate. Even with the "clunkiness" of Google Translate, the introductory few paragraphs also let us know the names and setting as Hauff originally intended, so I will give those in bold type. Lord! Those do very wrong who believe that there was only Times of Harun Al-Rashid, the ruler of Baghdad, fairies and where magicians, or even assert that reports of the Driving the genii and their princes, which one of the narrators listens to the markets of the city, were untrue. Even today there are Fairies, and it is not so long ago that I myself witnessed a Incident was where apparently the geniuses in the games were, even as I will report. In a major city of my dear fatherland, Germany, a shoemaker who lived many years ago with his wife and quite simply. He sat by day on the corner of the street and mending shoes and slippers and made probably new when a what might trust him; but he then had to buy the leather first, because he was poor and had no supplies. His wife sold vegetables and fruits that they planted in a small garden in front of the gates, and many people liked to buy with her because she was dressed neatly and cleanly and expand their vegetables on pleasing kind knew. The two folks had a nice boy, pleasant face, well designed and quite large for the age of twelve. He would usually with the mother sitting on the vegetable market, and the women or chefs who had bought a lot in the shoemaker wife, he wore probably a part of the fruit home, and he rarely came back from such a transition without a beautiful flower or a piece of money or cake; because the rulers of these chefs looked like it if you brought the beautiful boy home, and presented him always plentiful. One day the cobbler's wife was sitting as usual in the market, they had the right to some baskets with cabbage and other things vegetables, all kinds of herbs and seeds, even in a smaller baskets early pears, apples and apricots. The little Jacob, so was the boy sitting next to her and cried in a clear voice the goods out: "This way, gentlemen, behold the beautiful carbon as fragrant these herbs; early pear, you women, early apples and apricots, who buy? My mother gives it cheap. " So cried the boy. 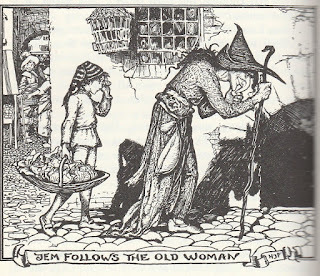 As an old woman came forth on the market; They looked a little torn and ragged, had a small, spitziges face, all furrowed with age, red eyes and a pointed, aquiline nose, the desired down to the chin; she went on a long stick, but could not say how they went to; because she limped and slipped and staggered; it was as if she had wheels in the legs and can invert all moments and fall with the pointed nose on the pavement. The woman of the shoemaker looked this woman carefully. There were now but already sixteen years that she sat daily in the market, and she had never noticed this strange figure. But she was frightened involuntarily, as the Old zuhinkte to them and rested on their baskets. "Are you Hanne, the greengrocer?" asked the old woman with unpleasant, croaking voice by constantly shaking his head back and forth. Fortunately Lang's version seems fairly close, although for some strange reason the boy is named Jem. You may remember seeing earlier, in part 1, my use of this illustration. All illustrations today are by H.J.Ford from The Violet Fairy Book unless otherwise labeled. Another difference between Lang and Hornstein is the entire story is told without dividing it into parts. 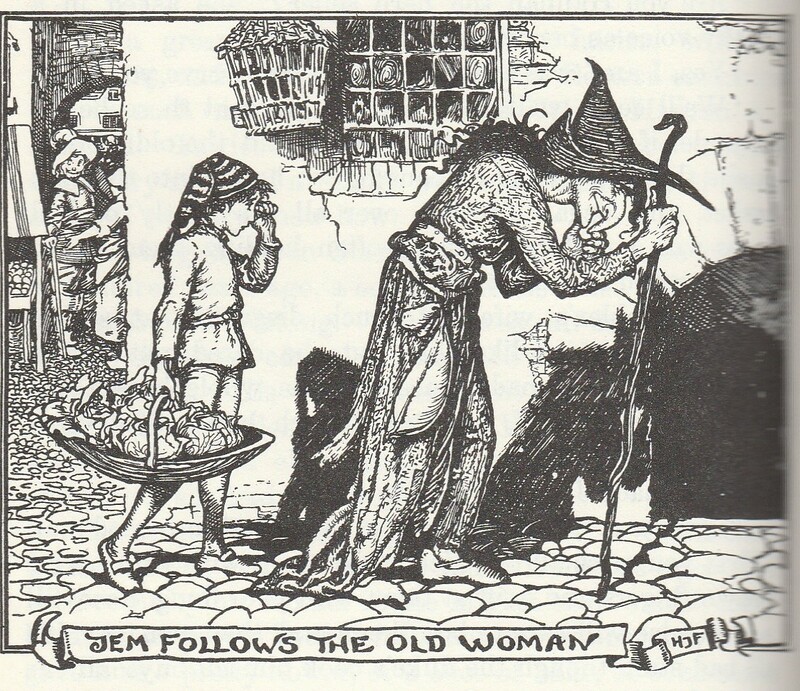 The main differences, beyond setting, deal with what happens to children in the house of the mysterious "old woman." They are guinea pigs or squirrels walking around on their hind legs. The guinea pigs wear nutshells for shoes and men's clothes in the newest fashion, while the squirrels wear full Turkish trousers and little green velvet caps. After Jem eats some soup, he enters a dream state where "the old woman took off all his clothes and wrapped him in a squirrel skin, and that he went about with the other squirrels and guinea pigs, who were all very pleasant and well-mannered, and waited on the old woman." After seven years he smells a very strong smell that makes him sneeze repeatedly, waking him from what he believes was a dream. He goes back to the market thinking he should return to his mother and finds this reaction. Similarly his father doesn't recognize him. Now we finally are ready to enter today's version of the story's ending. 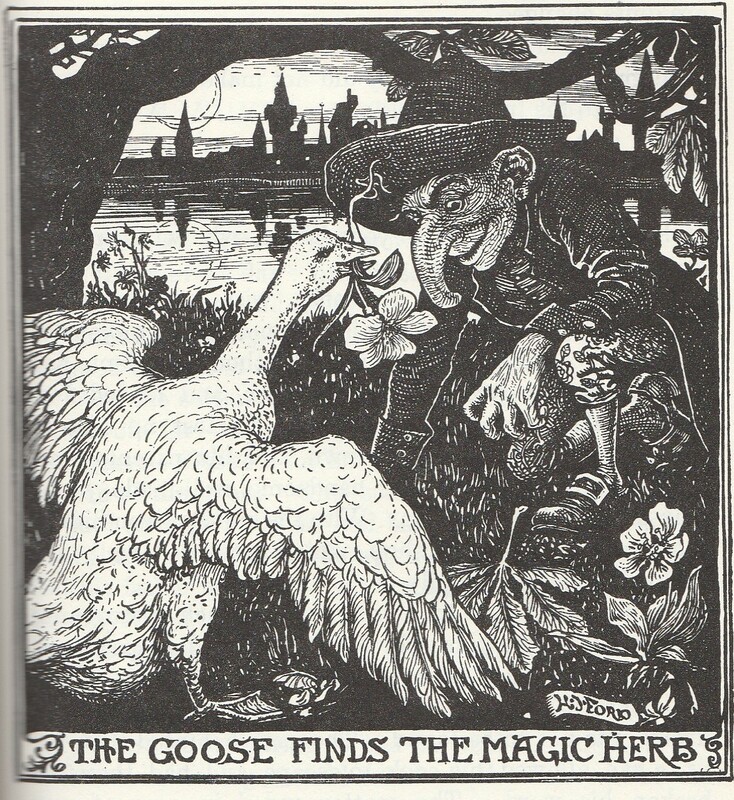 If you don't have a copy of The Violet Fairy Book handy and want to read the earlier part of the story, it's in many places on the internet, including Sacred-texts.com, which has the texts of all the 'Colored' Fairy Books compiled by Andrew Lang. Currently, they have the complete text of this series and are in the process of adding page numbering and illustrations to the text. There's only one more illustration by H.J. Ford, but it's not to be missed if you want to understand this version of the story. I'll insert it along with a picture from a similar version in another translation of the story. We start with Jem going to work in the duke's kitchen. He lost no time in setting to work, and everyone rejoiced at having him in the kitchen, for the duke was not a patient man, and had been known to throw plates and dishes at his cooks and servants if the things served were not quite to his taste. Now all was changed. He never even grumbled at anything, had five meals instead of three, thought everything delicious, and grew fatter daily. And so Jem lived on for two years, much respected and considered, and only saddened when he thought of his parents. One day passed much like another till the following incident happened. Dwarf Long Nose—as he was always called—made a practice of doing his marketing as much as possible himself, and whenever time allowed went to the market to buy his poultry and fruit. One morning he was in the goose market, looking for some nice fat geese. No one thought of laughing at his appearance now; he was known as the duke's special body cook, and every goose-woman felt honoured if his nose turned her way. He noticed one woman sitting apart with a number of geese, but not crying or praising them like the rest. He went up to her, felt and weighed her geese, and, finding them very good, bought three and the cage to put them in, hoisted them on his broad shoulders, and set off on his way back. 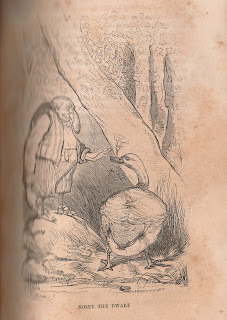 Quite frightened, the dwarf set down the cage, and the goose gazed at him with sad wise-looking eyes and sighed again. This was but small comfort for Jem, for how and where was he to find the herb? From this time the little cook was hardly seen except in the kitchen, where, surrounded by his helpers, he gave orders, baked, stewed, flavoured and dished up all manner of dishes. The prince had been a fortnight with the grand duke, and enjoyed himself mightily. They ate five times a day, and the duke had every reason to be content with the dwarf's talents, for he saw how pleased his guest looked. On the fifteenth day the duke sent for the dwarf and presented him to the prince. 'As your highness pleases,' said the dwarf, and took leave. Sure enough, next day a magnificent pasty all wreathed round with flowers was placed on the table. Jem himself put on his best clothes and went into the dining hall. As he entered the head carver was in the act of cutting up the pie and helping the duke and his guests. The grand duke took a large mouthful and threw up his eyes as he swallowed it. The grand duke flew into a rage. The grand duke was more furious than ever. The poor dwarf hurried back to his room, and poured out his grief to the goose. He did as she bade, and as soon as they were in the garden put her on the ground, when she waddled off as fast as she could towards the lake, Jem hurrying after her with an anxious heart, for he knew that his life depended on her success. The goose hunted everywhere, but in vain. She searched under each chestnut tree, turning every blade of grass with her bill—nothing to be seen, and evening was drawing on! The dwarf stood gazing at the plant. It gave out a strong sweet scent, which reminded him of the day of his enchantment. The stems and leaves were a bluish green, and it bore a dark, bright red flower with a yellow edge. So they went back to Jem's rooms, and here he gathered together some fifty ducats he had saved, his clothes and shoes, and tied them all up in a bundle. Then he plunged his face into the bunch of herbs, and drew in their perfume. As he did so, all his limbs began to crack and stretch; he felt his head rising above his shoulders; he glanced down at his nose, and saw it grow smaller and smaller; his chest and back grew flat, and his legs grew long. Jem folded his hands in thanks, as his heart swelled with gratitude. But his joy did not make him forget all he owed to his friend Mimi. The goose accepted his offer with joy, and they managed to slip out of the palace unnoticed by anyone. They got through the journey without accident, and the wizard soon released his daughter, and loaded Jem with thanks and valuable presents. He lost no time in hastening back to his native town, and his parents were very ready to recognise the handsome, well-made young man as their long-lost son. With the money given him by the wizard he opened a shop, which prospered well, and he lived long and happily. I must not forget to mention that much disturbance was caused in the palace by Jem's sudden disappearance, for when the grand duke sent orders next day to behead the dwarf, if he had not found the necessary herbs, the dwarf was not to be found. The prince hinted that the duke had allowed his cook to escape, and had therefore broken his word. The matter ended in a great war between the two princes, which was known in history as the 'Herb War.' After many battles and much loss of life, a peace was at last concluded, and this peace became known as the 'Pasty Peace,' because at the banquet given in its honour the prince's cook dished up the Queen of Pasties—the Suzeraine—and the grand duke declared it to be quite excellent. Both versions end with a "happily ever after." Some question the way fairy tales end so unrealistically. I find the answer in children's psychologist, Bruno Bettelheim's, The Uses of Enchantment; The Meaning and Importance of Fairy Tales. The book is still available and various PDFs are available online. In its briefest form, go to the 14 page Introduction to the book. Bettelheim saw fairy tales as useful in their very darkness. Precisely because stories offer abandonment, death, witches, and injuries, they let children grapple with their fears in remote, symbolic terms like a daydream, permitting the child's imagination to expose them to dimensions otherwise they might not discover. Bettelheim himself was a Holocaust survivor, so I believe this points beyond children to its use for adults, too. He believed not permitting such exposure to the unconscious would later cripple the personality and overwhelm the person. He knew parents wanted children to believe all people are good and to see only the sunny side of life, but he saw the very struggle and eventual mastery of obstacles as neither escapism nor giving in. He further valued the simplification of fairy tales as showing both the attractiveness of evil and offering ease of identifying with the hero. The very misunderstanding about "happily ever after" is discussed as preferable to more modern stories. Fairy tales show the importance of love and human bonding, while not clinging to the parent, in eventual healthy human development. Should we mention all of this when telling the tales? Dunberidiculous! He points out the value to those needing them happens in this very way of working with a sense of enchantment and letting the stories work with our unconscious. My own apologies for drawing the curtain back to reveal the mechanics of such "enchantment", but too often it still has detractors missing the whole point behind both such stories and their conclusion. So let's conclude our own entrance into Hauff's world for today. Whether set in the Middle East, Germany or wherever!, it has a value I hope you, too, have found. He also loaded to his server the doctorate thesis of Prof. Dov Noy (Neunan) "Motif-index of Talmudic-Midrahic literature" Indiana University, 1954, as a PDF file. in the hope that some of you would make use of it. You can see why that is a site I recommend to you. Have fun discovering even more stories! Hello to the "Hello Girls"